AmaWaterways will offer more river cruise opportunities in Vietnam and Cambodia for 2018. 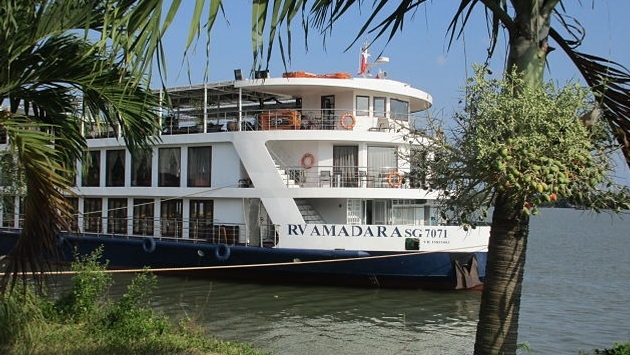 The AmaDara will sail either up or downriver along the Mekong for seven nights, tacking on pre- and post-cruise land extension options. “We are pleased to offer our guests more opportunities to experience the unique authenticity of the Mekong and the villages that line the riverbanks,” said Kristin Karst, executive vice president and co-owner of AmaWaterways, in a press release. On March 26, 2018, Sbragia Family Vineyards from the California Dry Creek Valley will lead AmaWaterways' first wine hosted cruise in Asia. Wine lectures and tastings onboard will be showcased, in addition to the included shore excursions. Such tours head to a Buddhist monastery, the royal palace in Phnom Penh, Xeo Quyt and a rice paper and candy-making workshop in Cai Be. Beyond excursions, experiences on the “Charms of the Mekong” and “Riches of the Mekong” itineraries will encompass cultural encounters and tasty cuisine. Experts along for the ride will convey Asian religions, architecture and history. The award-winning 124-guest AmaDara features a French Colonial aesthetic along with Mekong artifacts and accents. Private accommodations include a French and outside balcony in each cabin while other onboard amenities extend to a spa, sun deck pool and fitness room. Culinary features are the main dining room and The Chef’s Table restaurant with its fusion menu from award-winning executive chef, Primus Perchtold. Mekong 2018-19 itinerary savings can be had thanks to early booking rewards and past guest benefits. Select sailing reservations are eligible for triple rewards prior to July 31, 2017. 7-night cruises start at $1,549 per person.